Regardless of all the violations of human rights and the intention of the military to stay in power and continue to keep Egypt messed up, the Obama administration approved the military aid to Egypt recently. Not surprisingly, Camp David treaty is the main reason why there's no reason to question the Military Aid. The only reason they thought about questioning it was the incident of holding a bunch of Americans hostage in Cairo by the military, who then flew back home and left the Egyptians working with them in trouble . "President Obama, Mrs. Clinton and other senior officials explicitly warned Egypt’s military leaders that the aid this year was at risk because of the prosecution of the American-financed organizations, which include Freedom House, the International Republican Institute and the National Democratic Institute. 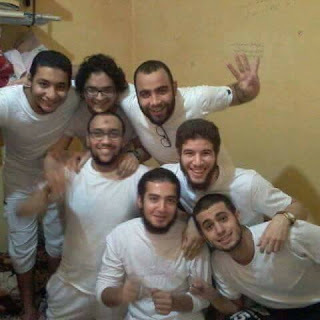 The case, which began in December, continues, though Egyptian authorities, under intense pressure from the administration, lifted a travel ban on the seven American employees of the groups. The individuals were allowed to depart after the groups paid nearly $4 million in bail. " There's absolutely nothing in their statements or comments about the military running over people by APCs and tanks made in the U.S. Nothing about military trials for over than 16,000 civilians since Jan 28th 2011 without any legal support. Nothing about "virginity tests" on female protesters and setting the criminals who did it free. Nothing about attacking peaceful protests, evacuating protest camps forcibly, shooting kids in their eyes and killing hundreds of protesters by life ammunition and tear gas also made in the U.S. While it's all available online, many people still wonder and don't know much about the Military Aid to Egypt and the strong/strategic mil-mil relationship between the Egyptian military and the U.S. I found this Q/A article that sums it all up (published Jan 2011) and wanted to keep these facts here in my blog as a reference and for the historical record to let Americans know what their government is doing with their education and health care money. Egypt gets the most U.S. foreign aid of any country except for Israel. (This doesn't include the money spent on the Iraq and Afghanistan wars.) The amount varies each year and there are many different funding streams, but U.S. foreign assistance to Egypt has averaged just over $2 billion every year since 1979, when Egypt struck a peace treaty with Israel following the Camp David Peace Accords, according to a Congressional Research Service report from 2009. That average includes both military and economic assistance, though the latter has been in decline since 1998, according to CRS. What about military aid—how much is it, and what does it buy? 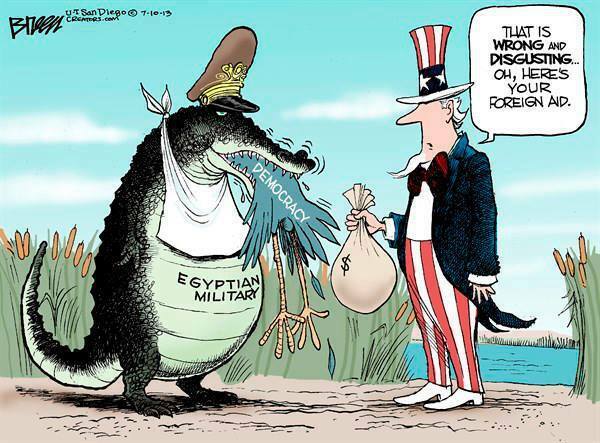 According to the State Department, U.S. military aid to Egypt totals over $1.3 billion annually in a stream of funding known as Foreign Military Financing. U.S. officials have long argued that the funding promotes strong ties between the two countries’ militaries, which in turn has all sorts of benefits. For example, U.S. Navy warships get “expedited processing” through the Suez Canal. The military funding also enables Egypt to purchase U.S.-manufactured military goods and services, a 2006 report from the Government Accountability Office explained [PDF]. The report criticized both the State Department and the Defense Department for failing to measure how the funding actually contributes to U.S. goals. The administration of former president George W. Bush had threatened to link military assistance to Egypt’s human rights progress, but it didn’t follow through. When exiled Egyptian dissident, Saad Eddin Ibrahim, called on the U.S. government to attach conditions to aid to Egypt, U.S. officials dismissed the idea as unrealistic. Who benefits from the military aid? Obviously the aid benefits Egypt’s military and whatever government it supports, which has so far been Mubarak’s. Foreign military financing is a great deal for Egypt—it gets billions in no-strings-attached funding to modernize its armed forces and replace old Soviet weapons with advanced U.S. weaponry and military equipment. According to the State Department, that equipment has included fighter jets, tanks, armored personnel carriers, Apache helicopters, anti-aircraft missile batteries and aerial surveillance aircraft. Egypt can purchase this equipment either through the U.S. military or directly from U.S. defense contractors, and it can do so on credit. In 2006, the GAO noted that Egypt had entered some defense contracts in advance of—and in excess of—its military assistance appropriations. Some of those payments wouldn’t be due in full until 2011, the GAO said. The other group that benefits from this aid arrangement is U.S. defense contractors. As we reported with Sunlight Foundation, contractors including BAE Systems, General Dynamics, General Electric, Raytheon and Lockheed Martin have all done business with the Egyptian government through relationships facilitated by high-powered DC lobbyists. U.S. economic aid to Egypt has declined over the years, but is generally in the hundreds of millions annually. Others were not as successful. A 2006 inspector general’s audit of a 4-year, $57-million project to increase jobs and rural household incomes found that the U.S. investment “has not increased the number of jobs as planned” among participants [PDF]. A 2009 audit of a $151 million project to modernize Egypt’s financial sector found that while the country’s real estate finance market experienced significant growth throughout the project’s duration, USAID’s efforts were “not clearly measurable” [PDF] and the growth could be due to market forces or the Egyptian government's actions. Critics of the Obama administration’s economic aid to Egypt have noted that in 2007, for instance, such aid only amounted to $6 per capita, compared with the $40.80 per capita spent on Jordan that same year. Ahmad El-Naggar, economic researcher at Al-Ahram Center for Political and Strategic Studies, criticized the U.S. in 2009 for focusing on “programs valued for strict ideological reasons,” and not on the country’s growing poverty and unemployment rate—two issues fueling the current protests. What about funding for democracy promotion and civil society? The Government of Egypt has resisted USAID/Egypt’s democracy and governance program and has suspended the activities of many U.S. NGOs because Egyptian officials thought these organizations were too aggressive. Per the Egyptian government’s complaints, the U.S. now limits its funding to NGOs registered with the government, therefore excluding most human rights groups, Huffington Post reported. Such funding has also declined sharply under the Obama administration. You are responsible and we can't deal with your government's problems in Egypt anymore because we have exhausted all the available solutions. It's your time to do something.